What do the 2011 Academy Awards have to do with hot dogs? Well, if I had to guess there are probably many actors and actresses that are wild about hot dogs. Why would I say that? Hollywood is home to one of the country's best Hot Dog Joints. Pink's Hot Dogs. If you check out their website, you'll see that they have devoted an entire page to photos of celebrities that dine at Pink's. But, that's not the answer I was searching for. I'll re-phrase my question to narrow it down. What does the movie that's favored to win "Best Picture" have to do with hot dogs? Need a hint? Okay, the movie I am referring to is, The King's Speech. Need another hint? Okay, there's also a connection to our day off (some of us) just last week, Presidents' Day. Did you get it yet? I'll post what I am alluding to in a comment soon. Take a guess. Two of the four members of the Yank's Franks research team, The Hot Dog King and I traveled south to Portsmouth, New Hampster today. Our destination was the little hot dog joint known as Gilley's PM Lunch. The place is a really cool, old wooden diner. Built in 1940 by The Worcester Diner Company it is the only one of the original five built that continues in full operation. It's very small, but really neat. Today's lunch for The HDK was going to be a cheeseburger and fries. While he was ordering I noticed a menu item that was unfamiliar to me (what fun!!!). I asked, "what is poutine?" As the person behind the counter described the French Fries covered in cheddar cheese curds and brown gravy, The Hot Dog King quickly adjusted his order and changed his fries to Poutine. The HDK really liked his hamburger. He and I had a long discussion about the size...is it 4 ounces, no that would be a quarter pound. Is it a 2 ounce slider, no it seems bigger. We settled on 3 ounces. Normally we would simply asked the person behind the counter, and normally that person would give us even more information than we asked for. Not here, it was apparent that these folks were a little short on "friendly." Perhaps they attended the Flo's Hot Dogs School of Customer Service. I just don't get it. For me, of course I was immediately attracted to the Chili Dog. Hey! Wait a minute, they also have Chili Fries. With regard to my Chili Dog...the good news was, there was plenty of chili and both the dog and the chili were pretty good (steamed dog on a steamed bun, I'm starting to get used to it). The bad news, look at the photo. How the heck was I to eat that. Don't get me wrong, I don't mind eating a generous chili dog with a fork and knife, but perhaps due to Homeland Security issues, Gilley's doesn't have plastic knives. At the suggestion of the "less than friendly" hot dogger on duty, I took an extra fork and attempted to mangle my dog into submission. It was a nasty fight in which both the chili dog and I ended up on the floor. In the end, I was victorious and the chili dog was very good. As for the Chili Fries, they were delicious. Fortunately, there were some that were not slathered in chili so I was able to get a taste of just the French Fries. The plain fries were also very good. Overall, I certainly would return to Gilley's for the food. Everything was good. If I wanted to make friends and have an awesome dessert, I would head across town to Roly's English Fudge where the people are super nice and the fudge is super delicious. Frankly, Yank's Franks has the NICEST hot doggers! No, I didn't misspell New Hampshire, I did it on porpoise. The Best Hot Dog in the Country!!! Rachel Ray and her Every Day Magazine has teamed up with the great folks at the food blog Serious Eats in search of the nation's best hot dog. A very worthy endeavor in my opinion. Unfortunately, Yank's Franks was not included in the selection process since we weren't yet in business at the time of the pairings. Similar to the methodology used by the NCAA, the country was divided into four quadrants. A total of 64 hot dogs joints in all were chosen, 16 from each section. 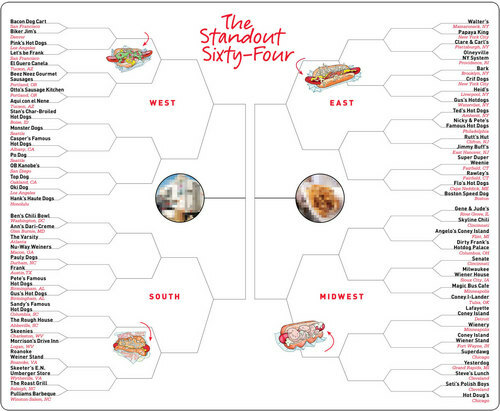 [Bracket chart is courtesy of seriouseats.com] In addition to others, the northeast was proudly represented by Flo's Hot Dogs. 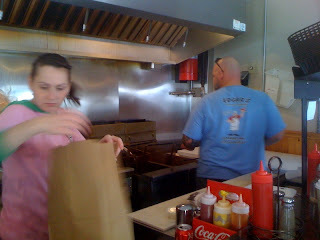 I am pleased to see that two joints were selected from Hot Diggity's and my old stomping ground, Fairfield, CT. Both Rawley's and Super Duper Weenie made the cut. I can attest to the fact that both joints are amazing. The three judges, Ed Levine, Adam Kuban and Hawk Krall combed over three thousand miles to select the grand prize winner. 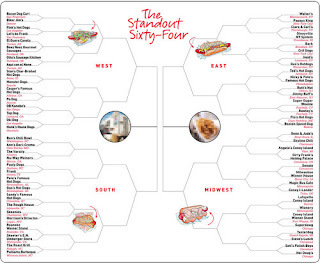 The East Coast bracket was likely the most difficult since there are so many great hot dog joints clustered up here in our corner of the country. When all was said and done, a small hot dog joint outside of Chicago was crowned, America's Best Hot Dog. The place is known as Gene & Jude's by some, but their sign identifies them as Gene's & Jude's. Call it what you like. I know next time I'm in the Chicago area, I'm stopping at Gene's & Jude's. I'll also be visiting Portillo's and Super Dawg and Hot Doug's and a few more of the Chicago greats. 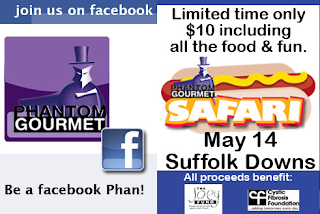 The Phantom Gourmet's Hot Dog Safari is not only "Hot Dog Heaven" but it also supports two wonderful charitable organizations. So while going from booth to booth getting your hot dog fill, you will feel great that your attendance is supporting The Joey Fund and The Cystic Fibrosis Foundation. Pencil in the date on your calendar and set your GPS units to Suffolk Downs. 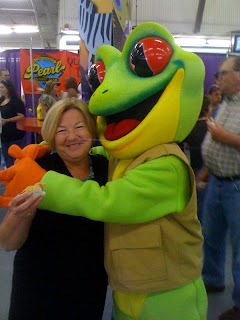 The 2011 Hot Dog Safari promises to be bigger and better than last year. As you can see from the smile on Hot Diggity's face, she made a new friend and had a great time at last year's Hot Dog Safari. 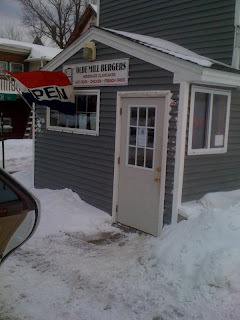 Located just off the main road through Sanford, Maine, Edgar's Olde Mill Burgers is truly a "joint" and I loved it. Double Dog Dennis, The Hot Dog King and I took a drive over the snowy roads of Southern Maine to try these famous burgers. Warning, call before you go, Edgar's has odd hours of operation. Let me tell you, it's worth the trip. The specialty of the house (or of the Olde Mill) is burgers, but the menu includes hot dogs, chicken and Edgar's homemade clam cakes. DDD tried the clam cakes since Edgar (aka Pete) is so proud of his creation. DDD gave the cakes an A rating. The HDK opted for a Zun Dog and and Scrambled Zun Burger. Zun Relish is Edgar's special recipe. It has a sweet taste from brown sugar and apples, but it also has a bite to it from some sort of pepper. The HDK loved his Zun Dog, but he couldn't stop praising The Scrambled Zun Burger. He went on and on until both DDD and I finally ordered one for ourselves. It was excellent. I had to try their Burger. How could I go to a burger joint and not have the burger. For my burger I chose grilled onions, pickles and mustard. Delicious!!! We all split orders of Fries and Rings. The rings were good, but the fries were excellent. I washed everything down with a draft root beer. It's served ice cold with no ice, just pure root beer. When travelling to or through Sanford, do not miss Edgar's Olde Mill Burgers on Washington Street.